Ashura-ou is first introduced as the god of war and guardian of Heaven under the former Emperor, who died defending his lord against Taishaku-ten and is revered as a hero. However, it turns out at the end of the manga that he had, in fact, engineered Taishaku-ten's rebellion himself: Knowing through Kuy-ou's prophecy and his own visions of his future son's true nature as the "true Ashura", he nonetheless wished for his son to be born. To change destiny and prevent Ashura's awakening, he asked for Taishaku-ten's help, which Taishaku-ten promised in return for his body. Ashura-ou married Shashi so she, one of the priestesses bearing one of Ashura's seals on her forehead, would be his mother, whom Ashura presumably would not wish to kill. He had Taishaku-ten seize the throne and rule cruelly, to prevent the Six Stars from gathering. As a last safeguard, should Ashura still awaken, he asked Taishaku-ten to kill him and eat his body, so he might become strong enough to kill Ashura. 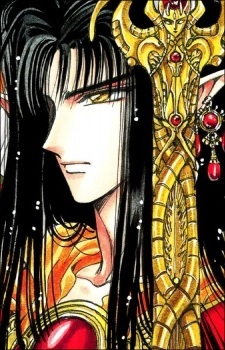 In Tsubasa Reservoir Chronicle, Ashura-ou is the king of the cold world of Celes. At the beginning of the manga, he is sealed in a magical sleep by Fay D. Flourite, who then proceeds to flee from him through different worlds. It is later revealed that he collected Fay from imprisonment from another world and brought him up. However, the Ashura's nature in RG Veda is mirrored in Tsubasa: Ashura-ou, too, has another side, and regularly goes on killing sprees among his subjects. He took Fay in to draw his curse to kill everyone stronger than him upon himself, and die on Fay's hands.